Behind the user listening platform Ferpection is a team that is organized around the principles of a liberated company. In this context, we feel it's important to publicly disclose our pay scale. Mention and, closer to us, Alan have undertaken similar initiatives, and I'm proud to join them. Why publish our pay scale? Transparency. This is one of the key elements of liberated companies. Unfortunately, simply writing things on meeting room walls is not enough to make it a reality. Ferpection employees already have access to bank accounts, payroll records, and the business model - essentially all of the company's financial data. Disclosing salaries internally fits into this approach. Simplicity. Disclosing salaries simplifies everyone's life. There is no more negotiating as part of the hiring process, nor at the end of the year, nor is there any need to spend time with someone who wouldn't be comfortable with our culture. It's also a way of refocusing discussions on important management topics, which allow our employees to grow without creating distractions related to money. In addition, I am convinced that at equal or even lower pay, our approach makes us more competitive in the job market, compared to other companies. Because this approach reflects our internal culture of well-being. Decision-making autonomy. In order for employees to be empowered to make decisions, they need to be aware of the financial impact of their decisions. This is why we've linked our business model to our pay scale. As a result, any employee can estimate the impact of recruiting a new developer or a new salesperson, for example, and see the effect it has on the company's profitability or the calibration of objectives in terms of revenue, etc. A base salary of 2,300€ net for everyone. We speak in terms of "net" because it's more meaningful. Google Sheets automatically converts salaries to "gross" for contracts and business expenses for our business model. Years of experience at the time you join Ferpection Only the years of experience relative to your position are counted. Years of training (internship, apprenticeship) do not apply. Loyalty bonus Employees automatically receive a salary increase, as long as Ferpection achieves growth of at least 40% and generates a profit. This has always been the case. Company bonus When operating income is sufficient, we award a company bonus that equates to an individual bonus of one to two months of the lowest salary. Unlimited paid leaves. No one joins Ferpection to count their days or hours. As long as the work collectively gets done, it's understood that we all have personal obligations and other things we want to do in our lives. These things don't necessarily require five weeks in a linear fashion each year. Sometimes it's more, sometimes it's less, and that's what we wanted to recognize. The following table addresses these elements: It's in English, as is everything we produce internally, in anticipation of our international plans. Fewer criteria for more simplicity We ended up keeping only two criteria: past experience and the number of years at Ferpection. There is no difference in salary according to position. What justifies a different salary should be a different contribution. When I envision the absence of any employee, there's not one whose absence would have a bigger impact than another's. Remove our Community Success Manager, and we would experience serious issues with our user tests production in the short term. Remove me as CEO, and strategic decisions wouldn't be made in the mid-term. But we cannot say that one is more important than the other, at least in our company. The role of the collective. With other salary scales, we don't hear about company-wide performance, except with respect to stock options. In principle, stock options can be great, but they're unpredictable. And the time lag between performance and pay is concerning. We have made the choice to reward company-wide performance on a yearly basis. You might notice that, even with identical experience, my salary is lower than that of my partner, Arnaud Limbourg. This was a deliberate choice to free up cash flow for the business, rather than about having a better income in the short term. I'm acting as an investor in this capacity. To dispel any doubt, there are no sales commissions in our pay scale. We trust salespeople to sell at their highest level, they trust Customer Success Managers to satisfy clients, and everyone trusts the technical employees to build the platform. No one is more valuable than the other, and everyone is focused on end results. Finally, many contributors are not salaried employees, but work with us on a freelance basis via case-by-case arrangements. And tomorrow, will you join us? 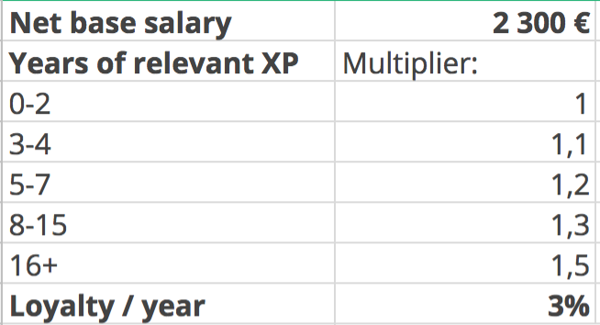 This is the first iteration of our pay scale which, as with almost everything at Ferpection, will evolve. If it is suitable for the internal team, we'll see how it does in the market. This article inspired you to know more about Ferpection? Then don't waste a minute and send us your resume at hello@ferpection.com or send your application on our Welcome to the jungle page.